The Kentucky Nonprofit Network is Kentucky's state association of nonprofits. Founded in 2002, KNN exists to strengthen and advance the Commonwealth's nonprofit organizations because nonprofits are essential to vibrant communities. KNN provides quality education, sharing of best practices and resources, technical assistance, time and money-saving member benefits and a unified public policy voice. Use KNN resources to find the information, help and/or training you need. There's no need to reinvent the wheel - start with KNN. Kentucky Nonprofit Network is the unified voice for Kentucky's nonprofit community. In partnership with our members, KNN monitors and takes action on the public policy issues that advance and impact our sector. 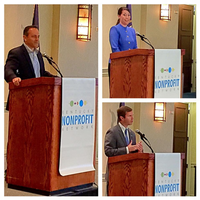 Advance and protect Kentucky's nonprofit sector. Educate nonprofit organizations on their rights and responsibilities as advocates, as well as the skills needed to engage effectively in advocacy. Enable KNN members to weigh in on significant national policy issues through participation in the policy activities of the National Council of Nonprofits. Advocate - Your Voice Matters!